Forestburgh, New York (June 25, 2012) Danny O’Brien and James McKiernan driving a Subaru Impreza WRX STi won the Rally New York Summer Rallysprint 2012 this past Saturday. 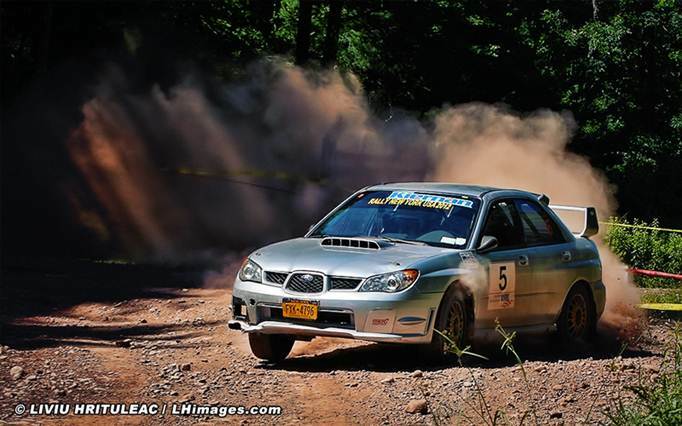 The Rallysprint took place on the roads of the Ten Mile River Scout Reservation on Narrowsburg. The event was a round of the New York Rally Championship – Thunder 102 Cup. Summer Rallysprint 2012 is a short rally with 50 miles of special stages and the total length of 86 miles. This one-day Rallysprint offers full reconnaissance in the morning followed by competition that starts in late morning. These roads will become part of the International Rally New York on October 20 – 21 that will be the final round of the 2012 United States Rally Championship. A small but strong field assembled under the sunny skies of Southern Catskill Mountains of New York. Three strong entries withdrew shortly before the event: Enda McCormack in a Mitsubishi Evo 6, who is competing in Ireland this season, and Aidan McCormack also in a Mitsubishi Evo 6 had to fly to Ireland on the day of the rally to attend a funeral of a brother of another Rally New York competitor killed as a passenger in a car accident. O’Leary brothers withdrew because their car was not ready. A single 6.25-mile gravel, challenging and bumpy stage was run two times in each direction and this was repeated again after the lunch break. Watching rally cars blasting down the long hill followed by a high-speed turn at the Aquehonga Spectator Area was a real treat for true rally enthusiasts. The first seeded entry of Martin Donnelly and Dominik Jozwiak in a Mitsubishi Evo 9 had a mechanical failure on the first stage and had to withdraw. Martin is another driver competing in Europe this year. From that point on, Danny O’Brien with James McKiernan in McKiernan’s new Subaru Impreza WRX STi were in control and remained in the lead for the rest of the rally. They were closely followed by Cyril Kearney with daughter Caitlyn in a Subaru Impreza WRX STi and by Alvin Fong with Billy Machin in a production Mitsubishi Evo 9. The fast team of Fong and Machin got as high as the second place but unfortunately had an accident on the next to the last stage and were blocking the road for the following cars. The accident ended the rally for Fong and Machin. Officials considered throwing that stage - special stage 7 - but found that this did not change the overall standings and in the end all eight stages were classified. The last year’s winners Niall Johnson and Daniela Manago in a Subaru Impreza WRX finished third overall and won the Production All-Wheel-Drive (AWD) category. Ivan Orisek with Olga Orisek codriving in another Subaru Impreza WRX placed fourth overall and second in Production AWD. Tom Barton with Joachim Sandgaard in a Mitsubishi Evo 4, which Tom was racing for the very first time, acquainted themselves well with an AWD car after Tom drove a Two-Wheel-Drive (2WD) car for several years. In spite of some suspension problems, they finished in the fifth place, third in AWD. In the 2WD category, the winners were Keith Liggett with Scott Beliveau codriving in a Ford Focus, who ended up in the sixth place overall. Joao Ferreira and Seth Achilles in a VW GTI suffered a bent axle and were forced to withdraw. They did not leave the rally and graciously went and helped on a stage crew. The prize money went to O’Brien / McKiernan, Johnson / Manago and Liggett / Beliveau for winning their respective categories.